Have a digestive issue? Try a Sazerac. The Peychaud’s bitters from New Orleans was originally used to heal stomach problems. Cold to the bone? Try some Navy Grog. With Scurvy being a critical issue in sailors, this winter warmer with rum and lemon juice was used in the 17th & 18th centuries. Sweltering in a sticky summer? Almond Pastis is your cure. Pastis is the cool drink of southern France, with cold anise flavored liquor that turns white when mixed with ice water. If you’ve had all of the above and are feeling a bit green, restoratives hair of the dog cocktails like the Corpse Reviver, full of Caribbean flavors as well as spices and alcohol it will help you to forget. Hot toddies have long been used to relax you after a long day. How about Mexican Sleep Cure for your insomnia? That Mescal will certainly help you sleep. When I have a cold, I make my own Nyquil: 3 oz whiskey, healthy squeeze of lemon juice, 1 TBSP of brown sugar, cloves, and hot water. Stir with a cinnamon stick. You could also try a Lemon Balm Gin & Tonic. Lemon Balm has been a popular herban pain killer for centuries, and is used in many digestives such as Amaro and Chartreuse. Finally, if you’re in a bad mood – snap out of it! Cheer in a glass, the Milk Thistle Spritz takes a commonly used herbal elixer detoxifies the liver and is a tasty treat. Apothecary Cocktails also includes several recipes for syrups and infusions used in the cocktail creations, like Cardamon simple syrup, and Shrubb simple syrup. I’ve tried, twisted, and tweaked several of these recipes and it’s a great addition to any bar. Enjoy! 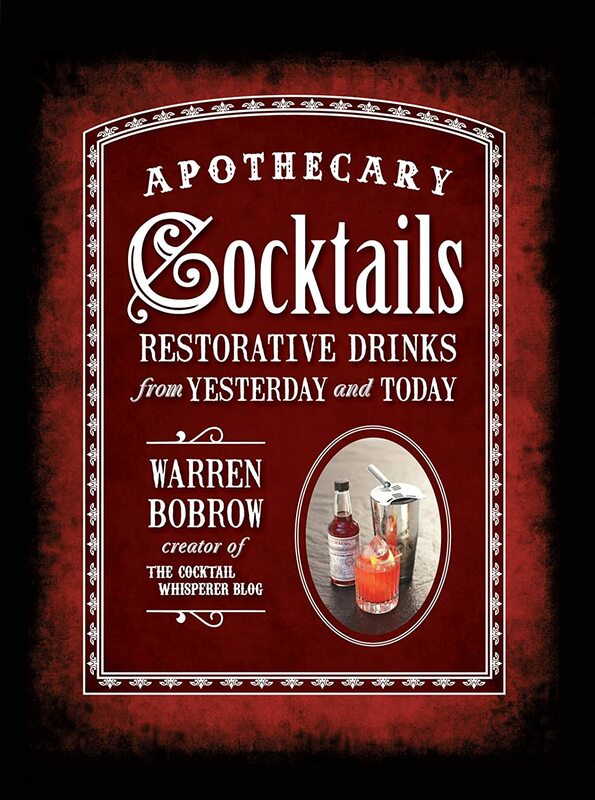 The book was provided by the publisher for consideration but all cocktails were created from my own hooch! Great work, keep it up .